A Grand Night: Mark Taper Forum and Ahmanson Theatres, Los Angeles Music Center, 135 N. Grand Ave., Downtown Los Angeles. A one night only musical performance that highlights some of the greatest moments from Center Theatre Group’s history and a sneak peek at the seasons to come at the Mark Taper followed by reception and Gala Dinner at the Ahmanson. April 22. Fundraiser: (213/972-3192) Gala dinner tickets start at $5000.00 which includes pre-performance reception, prime seating locations for performance and unforgettable dinner. Performance tickets only start at $250.00 and can be purchased at CTGLA.org/AGrandNight. Aquarium of the Pacific Opens New Wing: Long Beach www.aquariumofpacific.org With its new expansion which opens May 24, 2019, the Aquarium continues its quest to create the aquarium of the future…a combination of aquarium, science center, art gallery, performing arts space and think tank to explore solutions to some of the world’s biggest environmental issues. The aquarium will house a state of the art immersive theater, exhibition space, an art gallery and several new live animal exhibits. As the new focal point, Pacific Visions will provide a platform to integrate the arts and sciences and will offer innovative ways to explore their impact on planet Earth and the ocean. Art of Motion Picture Costume Design: FIDM Museum History Gallery, 919 S. Grand Ave., Los Angeles (213/623-5821) www.info@fidmmuseum.org This year’s exhibition features a variety of film genres that represent outstanding achievement in costume design. Among the more than 100 costumes from 25 films from 2018 are all five Academy Award nominees for Best Costume Design on display. Fan favorites celebrate of the dedication and creativity of costume designers and their teams. Also on display Majesty and Mystery: Saving a Napoleonic Court Gown. Feb. 5-April 12. Black Is Beautiful: The Photography of Kwame Brathwaite: Skirball Cultural Center, 2701 N.
Sepulveda Bl., Los Angeles (310/440-4500) www.info@skirball.org Iconic images that amplified one of the most influential cultural movements of the 1960s. 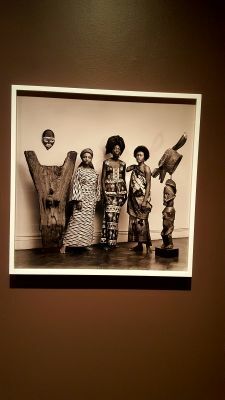 Features more than 40 photographs of black women and men with natural hair and clothes that reclaimed their African roots. First ever major exhibition dedicated to this key figure of the second Harlem Renaissance. April 11-Sept. 1. Catalina Adventure Activities: www.catalinachamber.com/ A new ropes and planks course weaves through a grove of towering eucalyptus trees deep within Descanso Canyon. Other adventurous activities nearby include Zip line Eco Tour and Catalina Climbing Wall and there is always hiking, camping and an adventure expedition. Charles White: A Retrospective: Los Angeles County Museum of Art (LACMA), 5905 Wilshire Bl., Los Angeles (323/857-6000) www.lacma.org A gifted draftsman and print-maker as well as a talented mural and easel painter, Charles White portrayed black subject almost exclusively. A social activist all his life, he championed racial pride and condemned the institutionalized racism faced by African Americans in all areas of life by using his art as a form of protest, affirmation and celebration, Feb. 17-June 9. Cinema Tuesdays: Skirball Cultural Center, 2701 N. Sepulveda B., Los Angeles (310/440-4500) www.skirball.org Free movies featured on the first two Tuesdays of each month, 1:30 p.m.
Culinary Events at the Gettys: Getty Center, 1200 Getty Drive off the 405. Getty Villa, 17985 Pacific Coast Highway, Pacific Palisades (310/440-7300) www.getty.edu/visit The J. Paul Getty Museum is offering a number of culinary events in the coming months spotlighting the lush gardens and bountiful herbs at both locations. Tea by the Sea, at the Villa, ongoing Thursdays and Saturdays. Limited tickets. Contact High: Annenberg Photo Space, 2000 Avenue of the Stars, Century City (213/ 403-3000) info@annenbergspaceforphotography.org Celebrating the photographers who have played a critical role in bringing hip-hop’s visual culture to the global stage, Contact High: A Visual History of Hip-Hop is an inside look at the world of hip-hop photographers, as told through their most intimate diaries: their unedited contact sheets. April 26-Sept 8. Imagination Dwells Here: Southern California Children’s Museum, 459 E. Colorado Bl, Pasadena () www.SoCalKids.org The first ever interactive children’s museum exhibition from the Bob Baker Marionette Theater featuring key elements of the Bob Baker experience including puppetry and manipulation, performance and enchantment introducing Baker’s world of creativity and imagination in a special engagement. Thru May 2019. Jazz at LACMA: Los Angeles County Museum of Art, 5905 Wilshire Bl., Los Angeles (323/857-6000) www.lacma.org Free jazz concerts every Friday night at 6pm at the Grand Entrance. Jeweled Isle: Art from Sri Lanka: Los Angeles County Museum of Art, 5905 Wilshire Bl., Los Angeles (323/857-6000) www.lacma.org The first comprehensive survey of Sri Lankjan art organized by a U.S. museum. More than 250 works addressing nearly two millennia of history. Dec. 9-June 23, 2019. Let My People Come: Skirball Cultural Center, 2701 N. Sepulveda Bl., Los Angeles (310/440-4500) www.info@skirball.org A Passover experience with Miry’s List. This Passover -themed evening of food and conversation is presented by Miry’s List, a nonprofit organization serving families resettling in America as refugees, together with the Skirball which is guided by the Jewish tradition of welcoming the stranger and inspired by American democratic ideals. Every year on Passover, Jews around the world invite guests to gather around the table to retell the story of the Jewish exodus from slavery in Egypt and share a meal in keeping with this ancient tradition. April 5. Ticket sales close 5:00 pm on March 29. Marciano Art Foundation Exhibitions: 4357 Wilshire Bl., Los Angeles (424/204-7555) www.marcianoartfoundation.org Pioneering multimedia artist Yayoi Kusama’s work has transcend some of the most important art movements of the second half of the 20th century. Her exuberant sculptural installation, With All My Love For The Tulips, I Pray Forever (2011) work between the organic and artificial. And more…. Marionette Theater: Bob Baker Marionette Theater, 4949 York Bl., Highland Park www.bobbakermarionettetheater.com After 55 years this theater for children has moved to a new location. The new location will continue its mission to educate, celebrate and rejuvenate puppetry and the allied arts. The historic marionette company will begin its preview season early summer of 2019. Masters of the American West Art Exhibition and Sale: Autry Museum of the American West, 4700 Western Heritage Way, Los Angeles. Widely considered the country’s premiere Western art show, Masters features painting and sculptures by 64 nationally recognized contemporary Western artists. Meet and Greet Series: Skylight Studios, Annenberg Space for Photography, 2000 Avenue of the Stars, Century City (213/403-3000) www.annenbergspaceforphotography.org Multi-media venue located directly across from the Space for Photography offers a free lecture series with attendees given the opportunity to interact one on one with the featured guest speakers. Free. No reservations necessary. New Exhibitions at the Wende: Wende Museum of the Cold War, 10808 Culver Bl., Culver City www.info@wendemuseum.org Crumbling Empire: The Power of Dissident Voices, Upside Down Propaganda: The Art of North Korean Defector Sun Mu, Red Alert! Air Raid Sirens of Los Angeles art installation by Nicole Weingart. Opening Feb. 10. Obsidian Ladder: Marciano Art Foundation, 4357 Wilshire Bl., Los Angeles www.marcianoartfoundation.org The first large scale solo exhibition in the United States by Bolivian American artist Donna Huanca. Her site specific installation for this exhibition ‘s 13,000 square food Theater Gallery will reveal a new topography o triggered senses, combining sound, scent and live performance. These elements will be experienced together against a constellation of carved steel sculptures and skin painting. June 28-Dec. 1. Ojai Playwrights Gala Benefit: Aspen Grove Ranch, Ojai www.ojaiplays.org The Ojai Playwrights Conference launches its 22nd season with a farm-to-stable celebration in a stunning private ranch. The reception features fine wines from Ojai Alisal Vineyard, craft cocktails and tasty appetizers. Attendees gather under a big top tend to enjoy an original show produced for the Gala with songs and dramatic scene readings performed by celebrity guest artists. The evening culminates with a four-course dinner with all proceeds going to the support and development of new plays for the American theatre at the annual Summer Conference and New Works Festival in Ojai. May 4. Photoville LA: la@photoville.com 50 exhibitions from local and international photographers displayed inside repurposed shipping containers, light cubes, light-boxes and installations. I till also bring together Los Angeles based cultural institutions for nighttime projections, talks, workshops, family-friendly activities, Smorgasbord food vendors and a community beer garden. Free. April 26-28 & May 2-5. Pontorma: Miraculous Encounters: Getty Center, 1200 Getty Drive off the 405. (310/440-7300) www.getty.edu/visit At the end of the 1520s, the painter Jacopo da Pontormo created one of his most moving and innovative altarpieces, the Visitation. This exhibition presents Pontormo’s spectacular painting alongside its preparatory drawings and two exceptional portraits painted during the same tumultuous period. Feb. 5-April 28. Public Programs and Exhibitions at The Huntington: The Huntington Library, Art Collections and Botanical Gardens, 1151 Oxford Rd., www.huntington.org An assortment of fascinating topics and displays with talks and book signings, garden tips, music, film, lectures, exhibitions and tours. Rauschenberg: The 1/4 Mile: Los Angeles County Museum of Art www.LACMA.org (323/857-6000 ) An expansive and immersive installation featuring Robert Rauschenberg’s magnum opus The 1/4 Mile or 2 Furlong Piece (1981-98). Completed over a period of 17 years, the piece is composed of 190 panels that, combined, measure approximately 1,000 feet in length. The 1/4 mile span is representative of the artist’s central belief in working in the gap between art and life. Oct. 28-June 9, 2019. Science Takes Center Stage: San Diego Natural History Museum, 1788 El Prado, San Diego in Balalboa Park (877/946-7797) www.sdnat.org A new slate of programming focuses on conservation and biodiversity City Nature Challenge, April 26-29 in which San Diego residents and visitors are asked to document as many species as possible using iNaturalist. Skirball Events: Skirball Cultural Center, 2701 N. Sepulveda Bl., Los Angeles (310/440-4500) www.info@skirball.org Skirball Puppet Festival: Fantastic Creatures, April 28. Soul of a Nation: Art in the Age of Black Power 1963-1983: The Broad, 221 S. Grand Ave., Los Angeles www.thebroad.org/programs The internationally acclaimed exhibition celebrates the world of Black artists made over two decades beginning at the height of the civil rights movement. Los Angeles based artists appear throughout the exhibition, foregrounding the significant role of Los Angeles in the art and history of the civil rights movement and the subsequent activist era, and the critical influence and sustained originality of the city’s artists. Ticketed show. March 23-Sept. 1. Sounds of L.A.: Getty Center, 1200 Getty Drive off the 405. (310/440-7300) www.getty.edu/visit The Getty’s annual concert series exploring the city’s varied musical landscape. Each month features two concerts by charismatic musicians who combine global influences in unexpected and original ways. The lineup includes performances by Los Pleneros de la 21, LADAMA and Adiyta Prakash Ensemble. UCLA Public Arts Program: UCLA Westwood campus (310/825-2101) www.arts.ucla.edu/calendars and www.tickets.ucla.edu Programs include distinguished lectures by luminaries such as Pritzker Prize-winning architect Thom Mayne and Phillipe Vergne, student exhibitions showing work from UCLA’s top ranked fine arts programs, student performances directed by renowned faculty and the rich offerings of the Fowler Museum, the Hammer Museum and the Center for the Art of Performance at UCLA. Many of the events are free and all are open to the public. Ventura Music Festival: Ventura College of Performing Arts Center, 4700 Loma Vista Road, Ventura (805/648-3146) www.venturamusicfestival.org This summer the festival fills venues across the city with top tier music for two weekends of multi-genre music, dance performances and world class culture. Nuvi Mehta leads the Ventura Music Festival July 12-22. Your Ticket to Santa Barbara Car Free Experiences: www.SantaBarbaraCarFree.org The City’s award winning project with more than 100 community partners dedicated to making car free vacations care-free.